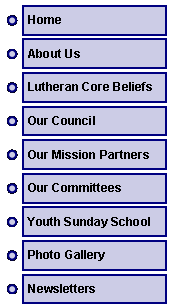 Bethel Lutheran is one of the nearly 10,000 congregations that make up the Evangelical Lutheran Church in America (ELCA). 1) We are saved by God's awesome grace, not by our own works. 2) God's ultimate act of love for us is shown in the death and resurrection of Jesus Christ, God's only Son. 3) Worship is centered on one God in three persons - Father, Son, and Holy Spirit. 4) The Old and New Testaments are the living Word of God, which continue to speak to us in new ways, offering guidance in our everyday lives. 5) The sacraments of Baptism and Holy Communion are two visible signs of God's love. In Baptism God claims us forever as God's own children; in Holy Communion Christ forgives and strengthens us in faith for daily living. 6) All baptized Christians are ordained as ministers, ministering to others daily in our families, our workplaces, and in our communities.